What differentiates Fortnite: Battle Royale from Playerunknown’s Battlegrounds? The former’s sense of humor, for one. Can you imagine finding bear-themed items in PUBG? The latest update applied to Fortnite this week added resolution and framerate improvements, new treasure chests, a new rare item called an Impulse Grenade….and Bear Force One, a special glider in the shape of a teddy bear. Bear Force One is accompanied by three other new items: the Tat Axe (a weapon in the shape of a Cupid arrow), Love Ranger (a costume that gives you the appearance of a statue), and Cuddle Team Leader, which actually lets you DRESS as a bear (a pink one no less). As you might notice, these are all themed for the Valentine’s season and are timed to disappear eventually. That’s where things get annoying. 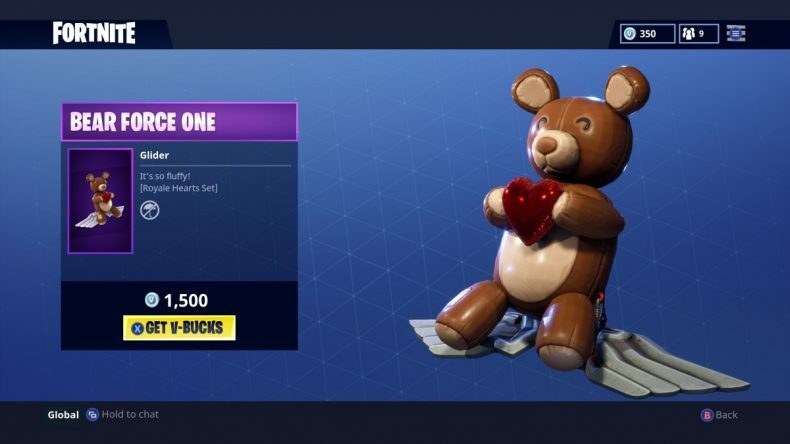 The bear glider is 1,500 V-Bucks, or the US Dollar equivalent of $15 (for our English readers, £12). Since Fortnite: Battle Royale is a free download, they have to make their cheddar somehow. What better way than by holding a bear hostage for ransom? The other themed items we mentioned cost even more. So if you haven’t saved up the V-Bucks you earn through playing the game, the only way to get the Bear Glider before it disappears is to buy it outright. But won’t you be the envy of your friends?